The intensive Arabic program is designed to rapidly develop a student’s language abilities by enabling them to engage with Arabic speakers confidently. Noor Majan believes that successful language acquisition occurs, when students are repeatedly challenged to develop their listening, speaking, reading, and writing abilities in a structured environment. Thus, Noor Majan’s intensive Arabic program reflects this idea by developing all four language skills with a focus on three distinct concentrations; foundational knowledge in Modern Standard Arabic (MSA), skills development, and application of knowledge and through media literacy. The program will provide intensive reading, writing, speaking, and listening practice for 25 formal contact hours per week, lasting for a total of 4 weeks per term, a total of 100 formal contact hours per month. In addition to the 25 formal contact hours per week, Noor Majan’s intensive Arabic course strengthens students abilities with 2 hours of language partner sessions per week. During these language partner sessions, students will learn how to apply their classroom knowledge in a real-life setting, solidifying their knowledge. For information on our program dates and prices please see below. Listening: Students will develop the ability to comprehend utterances in the target language in recorded from broadcast media, in both fusha (MSA) and commonly spoken Arabic as found in reports, interviews, and talk shows. Reading: Students will be introduced to texts from print media and internet using the grammatical structures under study. 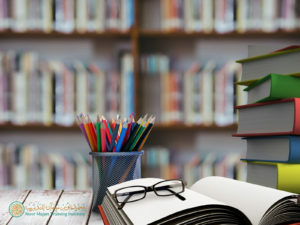 In this unit, students will read different genres of texts, learn and apply skimming techniques according to their level, understand in-depth the given texts and analyze them grammatically and style-wise. Students receive continuous feedback from instructors throughout the course. Evaluation is a reflection of the student’s proficiency, participation, engagement, and progress. Feedback is based on oral participation in class, results in quizzes, tests, and final exam as well as oral presentations in class and homework completion. Students can meet their teachers individually whenever they wish to discuss their performance and progress. At Noor Majan we recognize that successful language acquisition comes from a repetitive application of concepts and knowledge in real life situations. 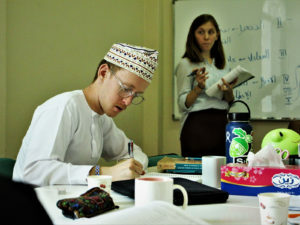 Thus, to support language growth we pair students with local Omani language partners for two hours every week. These individuals are given training on intercultural communication and strategies on how to support students studying Arabic. They encourage students to speak Arabic freely and to be confident in their language abilities. More than often language partners become students’ friends and serve as a mentor in engaging in the local culture. Friendships between language partners often lead to students being invited to their homes or to family events.